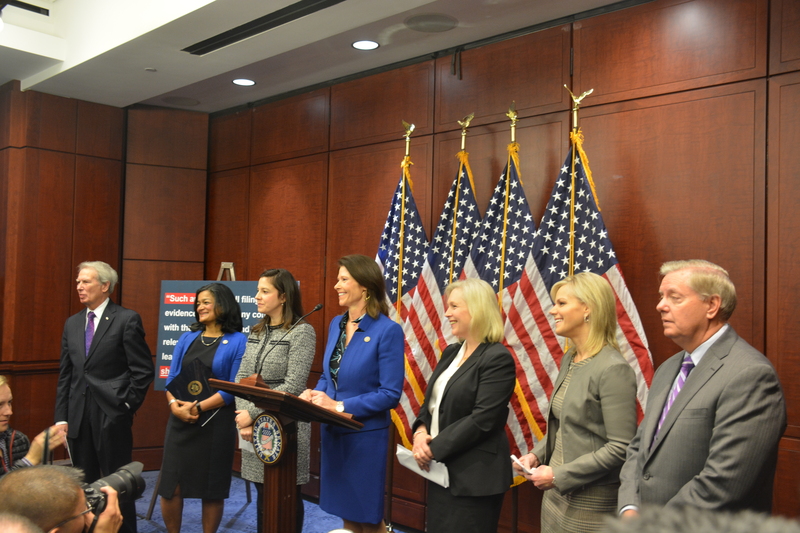 Washington, DC –Congresswoman Cheri Bustos and US Senator Kirsten Gillibrand today stood with former Fox News host Gretchen Carlson and a bipartisan group of Members of Congress to announce legislation to prevent sexual harassment in the workplace. The Ending Forced Arbitration of Sexual Harassment Act of 2017 would void forced arbitration agreements that prevent sexual harassment survivors from getting the justice they deserve. Carlson, who previously hosted “Fox & Friends,” left the network after enduring years of sexual harassment by powerful men who used forced arbitration to institutionalize protections for sexual harassers and prevent survivors from discussing their cases and taking them to trial. Today, an estimated 60 million Americans are subject to forced arbitration clauses. The bipartisan, bicameral bill that Gillibrand, Bustos, and Carlson announced would void forced arbitration agreements and allow survivors of sexual harassment or discrimination to seek justice, discuss their cases publicly, and eliminate institutional protection for harassers. Senators Lindsey Graham (R-SC), Lisa Murkowski (R-AK), Kamala Harris (D-CA), and U.S. Representatives Walter Jones (R-NC), Elise Stefanik (R-NY), and Pramila Jayapal (D-WA) are cosponsors of Bustos and Gillibrand’s legislation. Forced arbitration clauses prevent survivors of sexual harassment from discussing the nature or basis of their complaint. If an employee’s contract or employee handbook includes a forced arbitration clause, the employee is likely to have signed away his or her right to a jury trial whether or not they are aware of the clause. Employees are far more likely to win cases that go to trial than cases that go through the arbitration process.